Informative and entertaining, my favorite fantasy football podcast by far! The most lovable football-nerd dads. Great chemistry between the hosts, I listen to them for over 3 years now, made it to playoff every year largely because of them. their ultimate draft kit is the bomb! Favorite FF podcast by a mile. Informative, entertaining, great audio quality, epic Dad jokes. I have been listening since the beginning. they are truly the best in the business. solid fantasy advice with good humor! The Fantasy Footballers are back with another new episode! Andy, Jason, and Mike continue going through early fantasy rankings with quarterbacks! Where does Russell Wilson rank with recent contract extension issues? Is the Bakermania hype too extreme or does he belong in the Top 10? Prep your redraft, keeper, and dynasty teams for 2019 with insights you can only get on the #1 fantasy football podcast -- Fantasy Football Podcast for April 16th, 2019. The Fantasy Footballers are back with another offseason rankings episode! Andy, Jason, and Mike continue revealing their early WR rankings with players like Keenan Allen, Diggs & Thielen, Kenny Golladay, and plenty more! Who has the ability to outperform draft cost and finish in the Top 10? Plus, what does Austin Seferian-Jenkins signing with the Patriots mean for fantasy? Prep your redraft, keeper, and dynasty teams for 2019 with insights you can only get on the #1 fantasy football podcast -- Fantasy Football Podcast for April 11th, 2019. Early Rankings month continues with wide receivers! Andy, Mike, and Jason reveal their Top 10 WRs for the 2019 season. JuJu or Antonio Brown? Where does Odell Beckham rank with his new team? Prep your redraft, keeper, and dynasty teams for 2019 with insights you can only get on the #1 fantasy football podcast -- Fantasy Football Podcast for April 9th, 2019. The Fantasy Footballers are back with another offseason episode! Andy, Jason, and Mike continue revealing their early rankings with more running backs! Find out which players just missed the Top 10 list. Who has the ability to outperform draft cost and finish in the Top 10? Plus, what does C.J. Anderson signing with the Lions mean for Kerryon Johnson? Prep your redraft, keeper, and dynasty teams for 2019 with insights you can only get on the #1 fantasy football podcast -- Fantasy Football Podcast for April 4th, 2019. Early Rankings month has begun! The Fantasy Footballers return with another new episode, discussing the Top 10 Running Backs for 2019. Saquon or Zeke? Can Le’Veon Bell still finish as the top fantasy RB playing on the Jets? Plus, what does the Jordan Howard trade mean for fantasy football? Prep your redraft, keeper, and dynasty teams for 2019 with insights you can only get on the #1 fantasy football podcast -- Fantasy Football Podcast for April 2nd, 2019. The Fantasy Footballers are back with another new episode! Andy, Mike, and Jason debate if players should get fantasy points for drawing pass interference flags. Then after the latest NFL News, find out who the biggest free agency winners & losers are for 2019 fantasy football. Prep your redraft, keeper, and dynasty teams for 2019 with insights you can only get on the #1 fantasy football podcast -- Fantasy Football Podcast for March 28th, 2019. Is Gronk the greatest TE of all-time? The Fantasy Footballers are back with another new show! After covering the latest NFL News including Gronk's retirement, we look back on players that fantasy football owners may be forgetting about. Who was injured early in the 2018 season and could have a fantasy impact in 2019? Prep your redraft, keeper, and dynasty teams for 2019 with insights you can only get on the #1 fantasy football podcast -- Fantasy Football Podcast for March 26th, 2019. The Fantasy Footballers are back with the first Mock Draft show of 2019! By popular demand, we’re diving into a Dynasty league startup draft! How early will Pat Mahomes be selected? Should you draft an elite RB or WR in the first round? Plus, the latest NFL News and a discussion about rooting for your fantasy football team over your favorite team. Prep your redraft, keeper, and dynasty teams for 2019 with insights you can only get on the #1 fantasy football podcast -- Fantasy Football Podcast for March 21st, 2019. The Frenzy continues! Andy, Jason, and Mike dive into the latest Free Agent signings and what they mean for fantasy football. Plus, what’s the latest on Tyreek Hill? Then, after recapping the latest NFL News & signings, it’s Mailbag time! Prep your redraft, keeper, and dynasty teams for 2019 with insights you can only get on the #1 fantasy football podcast -- Fantasy Football Podcast for March 19th, 2019. The Fantasy Footballers are back with Episode 700! Odell Beckham is on the Browns! We react to the big OBJ trade and dive into a ton of NFL Free Agency news. What’s Le’Veon Bell’s fantasy football outlook on the Jets? Mark Ingram to the Ravens, Latavius Murray to the Saints, and so much more! Prep your redraft, keeper, and dynasty teams for 2019 with insights you can only get on the #1 fantasy football podcast -- Fantasy Football Podcast for March 14th, 2019. Antonio Brown is a Raider! The Fantasy Footballers discuss the big trade and what it means for AB, Derek Carr, and JuJu Smith-Schuster. The Free Agent Frenzy has begun; get the latest news on Carlos Hyde, Case Keenum, and others. All this plus, which players will fantasy football owners overreact on in 2019? Prep your redraft, keeper, and dynasty teams for 2019 with insights you can only get on the #1 fantasy football podcast -- Fantasy Football Podcast for March 12th, 2019. The Fantasy Footballers are back with one of the most important offseason episodes! Andy, Jason, and Mike take a look at the major coaching changes headed into 2019 and how they’ll impact fantasy football. This, plus a debate on the top pick in Dynasty Rookie drafts. Prep your redraft, keeper, and dynasty teams for 2019 with insights you can only get on the #1 fantasy football podcast -- Fantasy Football Podcast for March 7th, 2019. The Fantasy Footballers are back with a new episode after the 2019 NFL Combine! Get Combine reactions from Andy, Mike, and Jason before diving into the latest NFL News. Calling all you commissioners! Now’s the time to fix your fantasy football league; don’t miss 5 ways to make it better. Prep your redraft, keeper, and dynasty teams for 2019 with insights you can only get on the #1 fantasy football podcast -- Fantasy Football Podcast for March 5th, 2019. It’s NFL Combine Time! The Fantasy Footballers are back with another new offseason episode. We take a look at some unexpected results from the 2018 fantasy football season and predict if those trends will continue. Plus, the latest NFL News and what we’ll be watching for during the NFL Combine. Prep your redraft, keeper, and dynasty teams for 2019 with insights you can only get on the #1 fantasy football podcast -- Fantasy Football Podcast for February 28th, 2019. The Fantasy Footballers are back and ready to talk about the 2019 NFL Free Agents! First, Andy, Jason, and Mike each pick a big name player that they will be avoiding in 2019 fantasy drafts. Then it's time to preview NFL free agency and potential landing spots! Prep your redraft, keeper, and dynasty teams for 2019 with insights you can only get on the #1 fantasy football podcast -- Fantasy Football Podcast for February 26th, 2019. The Fantasy Footballers are back with one of the most important offseason episodes! First, Andy, Jason, and Mike each make a fantasy football wish for NFL Free Agency. Then it's the top 10 things that you must remember from the 2018 fantasy football season! Prep your redraft, keeper, and dynasty teams for 2019 with insights you can only get on the #1 fantasy football podcast -- Fantasy Football Podcast for February 21st, 2019. The Fantasy Footballers are back with another fun offseason episode as free agency approaches! Andy, Jason, and Mike each pick a player that will make a tier jump in 2019 fantasy football leagues. Then it's Mailbag time, answering a handful of listener questions! Prep your redraft, keeper, and dynasty teams for 2019 with insights you can only get on the #1 fantasy football podcast -- Fantasy Football Podcast for February 19th, 2019. Happy Valentine’s Day! Who’s your fantasy football valentine for 2019? Andy, Mike, and Jason reveal their picks before diving back into the 2018 Rookie Review! There were a ton of fantasy football relevant rookie RBs in 2018; what can we expect in 2019? All this, plus big Joe Flacco trade news. 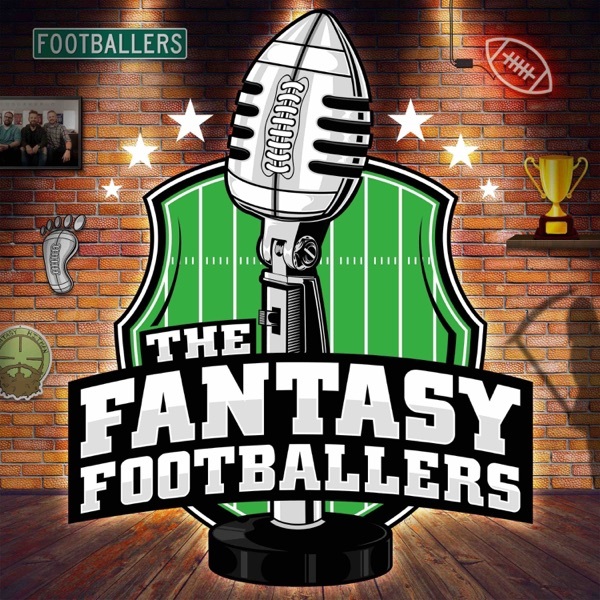 Manage your redraft, keeper, and dynasty fantasy football teams with insights you can only get on the #1 fantasy football podcast -- Fantasy Football Podcast for February 14th, 2019. Another Super Bowl in the books! The Fantasy Footballers discuss the big game, including if fantasy owners should be worried about Todd Gurley going forward. Plus, get the TRUTH about the top fantasy football tight ends of 2018! Join Andy, Mike, and Jason as they breakdown the seasons of Rob Gronkowski, George Kittle, Trey Burton, and other tight ends. Manage your redraft, keeper, and dynasty fantasy football teams with insights you can only get on the #1 fantasy football podcast -- Fantasy Football Podcast for February 5th, 2019. The Fantasy Footballers are back! Find out the TRUTH about the top fantasy football quarterbacks of 2018. Who was the most surprising? How many big games? Join Andy, Mike, and Jason as they breakdown the seasons of Deshaun Watson, Andrew Luck, and other top fantasy QBs! Manage your redraft, keeper, and dynasty fantasy football teams with insights you can only get on the #1 fantasy football podcast -- Fantasy Football Podcast for January 29th, 2019. Join our NFL Playoff Challenge group! The Fantasy Footballers are back again with the final show of 2018! We announce the nominations for our annual fantasy football awards, The Footies! Plus, get a quick review of Week 17 with Studs, Duds, and NFL news. Manage your redraft, keeper, and dynasty fantasy football teams with insights you can only get on the #1 fantasy football podcast -- Fantasy Football Podcast for December 31st, 2018. Go to FootieAwards.com before the next episode to cast your votes! Final matchup show of the season! Get a fantasy football preview for a bunch of Week 17 Matchups on this episode. Will Damien Williams save Mike’s Dynasty team? Get the latest NFL News and Notes including Week 17 injury updates. Finally, don’t miss our LIVE Draft during the Daily Dose. Manage your redraft, keeper, and dynasty fantasy football teams with insights you can only get on the #1 fantasy football podcast -- Fantasy Football Podcast for December 28th, 2018. What would you do for fantasy football if you were an NFL Head Coach? Hear some of the best listener answers on today’s show. The NFL regular season is coming to a close! We preview Week 17 Matchups before Andy, Jason, and Mike’s Starts of the Week! Manage your redraft, keeper, and dynasty fantasy football teams with insights you can only get on the #1 fantasy football podcast -- Fantasy Football Podcast for December 27th, 2018. The Fantasy Footballers are back again with a jam-packed episode after a wild championship week! Find out if Jason was able to bring home a #FootClanTitle against Brooks. We’ll recap which players were studly, and which ones disappointed in Week 16. And finally, get a breakdown on which NFL teams have something to fight for in Week 17. Manage your redraft, keeper, and dynasty fantasy football teams with insights you can only get on the #1 fantasy football podcast -- Fantasy Football Podcast for December 26th, 2018. Championship Week is upon us! Get a fantasy football preview for a ton of Week 16 Matchups on this episode. We’ll cover injury updates for Week 16 during In-or-Out, and don’t miss our LIVE Draft during the Daily Dose. Manage your redraft, keeper, and dynasty fantasy football teams with insights you can only get on the #1 fantasy football podcast -- Fantasy Football Podcast for December 21st, 2018. Championship Week is here! Let’s set those lineups to dominate during Week 16 and secure a #FootclanTitle! Get the latest news on Josh Gordon, Keenan Allen, and Melvin Gordon. Then it’s a fantasy football preview for a handful of Week 16 matchups before Andy, Jason, and Mike’s Starts of the Week! Manage your redraft, keeper, and dynasty fantasy football teams with insights you can only get on the #1 fantasy football podcast -- Fantasy Football Podcast for December 20th, 2018. Championship Week! Find out which players we’re concerned about for Week 16 during our “Pump the Brakes” segment. After Pump the Brakes and the latest NFL News, it’s a Mailbag show! We answer a handful of listener questions to help lead you to a #FootclanTitle! Manage your redraft, keeper, and dynasty fantasy football teams with insights you can only get on the #1 fantasy football podcast -- Fantasy Football Podcast for December 19th, 2018. Week 16 Waiver Wire! Look for these players to help your team, or block your opponent from getting them in Championship Week. First, we recap the Monday Night game between the Saints and Panthers. Get caught up on the latest injury news for Todd Gurley, Melvin Gordon, and others. Finally, don’t miss our Week 16 QB Streamer picks and which star QBs we would play them over! Manage your redraft, keeper, and dynasty fantasy football teams with insights you can only get on the #1 fantasy football podcast -- Fantasy Football Podcast for December 18th, 2018. Hear all about the fantasy football Studs & Duds of Week 15 and what to expect in championship week! We’ll review Week 15 injuries to Aaron Jones, Tyler Boyd, and others during the Weekly Rewind. All this, plus some fun fantasy football puns sent in from listeners and our Rising Stars of the Week! Manage your redraft, keeper, and dynasty fantasy football teams with insights you can only get on the #1 fantasy football podcast -- Fantasy Football Podcast for December 17th, 2018. Week 15 is underway! Get a fantasy football preview for a handful of Week 15 Matchups. We’ll cover injury updates for Week 15 during In-or-Out, and don’t miss our LIVE Draft during the Daily Dose. All this, plus a recap of the wild Thursday night game between the Chargers and Chiefs. Manage your redraft, keeper, and dynasty fantasy football teams with insights you can only get on the #1 fantasy football podcast -- Fantasy Football Podcast for December 14th, 2018. Week 15 is here! Let’s set those lineups to dominate in the second round of the fantasy playoffs! We discuss updates on Melvin Gordon, Tyreek Hill, Spencer Ware, Odell Beckham and others. Then it’s a fantasy football preview for a handful of Week 15 matchups before Andy, Jason, and Mike’s Starts of the Week! Manage your redraft, keeper, and dynasty fantasy football teams with insights you can only get on the #1 fantasy football podcast -- Fantasy Football Podcast for December 13th, 2018. It’s Round Two of the fantasy football playoffs! Find out which players we’re concerned about for Week 15 during our “Pump the Brakes” segment. Carson Wentz Breaking News! Get the lowdown on Melvin Gordon, Tyreek Hill, and Spencer Ware injuries during a fantasy football preview of Thursday Night Football: Chargers at Chiefs. All this, plus a number of listener questions answered to help in Week 15 and beyond! Manage your redraft, keeper, and dynasty fantasy football teams with insights you can only get on the #1 fantasy football podcast -- Fantasy Football Podcast for December 12th, 2018. Fantasy Playoffs Waiver Wire! Look for these players to help your team get the win in Week 15 and move on in the fantasy football playoffs. First, we recap the Monday Night game between the Vikings and Seahawks. Get caught up on the latest injury news for Austin Ekeler and Melvin Gordon, and don’t miss our Week 15 QB Streamer picks. Manage your redraft, keeper, and dynasty fantasy football teams with insights you can only get on the #1 fantasy football podcast -- Fantasy Football Podcast for December 11th, 2018. Hear all about the fantasy football Studs & Duds of Week 14 and what to expect during the rest of the fantasy playoffs! We’ll review Week 14 injuries to Tyreek Hill, Big Ben, and others during the Weekly Rewind. All this, plus some fun fantasy football puns sent in from listeners and our Rising Stars of the Week! Manage your redraft, keeper, and dynasty fantasy football teams with insights you can only get on the #1 fantasy football podcast -- Fantasy Football Podcast for December 10th, 2018. Week 14 and the fantasy playoffs are here! Get a fantasy football preview for a handful of Week 14 Matchups. We’ll cover the latest injury updates for Week 14 during In-or-Out, and don’t miss our LIVE Draft during the Daily Dose. Manage your redraft, keeper, and dynasty fantasy football teams with insights you can only get on the #1 fantasy football podcast -- Fantasy Football Podcast for December 7th, 2018. The fantasy playoffs are here and so is Jason! Get a fantasy football preview for a handful of Week 14 matchups before Andy, Jason, and Mike reveal their Starts of the Week! All this, plus big Emmanuel Sanders news and what it means for Courtland Sutton and the Broncos. Manage your redraft, keeper, and dynasty fantasy football teams with insights you can only get on the #1 fantasy football podcast -- Fantasy Football Podcast for December 6th, 2018. The fantasy football playoffs are coming! Find out which players made our “Pump the Brakes” list for Week 14. Get advice for Week 14 and the rest of the playoffs as we answer a handful of listener questions! Plus, a fantasy preview of Thursday Night Football: Jaguars at Titans. Manage your redraft, keeper, and dynasty fantasy football teams with insights you can only get on the #1 fantasy football podcast -- Fantasy Football Podcast for December 5th, 2018. Fantasy Playoffs Waiver Wire! Look for these players to help your team in Week 14 and the rest of the fantasy football playoffs. First, we recap the Monday Night game between the Redskins and Eagles. Get caught up on the latest injury news, and don’t miss our Week 14 QB Streamer picks. Manage your redraft, keeper, and dynasty fantasy football teams with insights you can only get on the #1 fantasy football podcast -- Fantasy Football Podcast for December 4th, 2018. Hear all about the fantasy football Studs & Duds of Week 13 and what to expect during the fantasy playoffs! We discuss the Kareem Hunt situation and Week 13 injuries during the Weekly Rewind. All this, plus some fun fantasy football puns sent in from listeners and our Rising Stars of the Week! Manage your redraft, keeper, and dynasty fantasy football teams with insights you can only get on the #1 fantasy football podcast -- Fantasy Football Podcast for December 3rd, 2018. Week 13 is here! Get the fantasy football breakdown for a handful of Week 13 Matchups. We’ll cover the latest injury updates for Week 13 during In-or-Out, and don’t miss our LIVE Draft during the Daily Dose. Manage your redraft, keeper, and dynasty fantasy football teams with insights you can only get on the #1 fantasy football podcast -- Fantasy Football Podcast for November 30th, 2018. Week 13 is here and the fantasy playoffs are coming! Get a fantasy football preview for a handful of Week 13 matchups before Andy, Jason, and Mike reveal their Starts of the Week! All this, plus the latest news and a quick question about preparing now for next season! Manage your redraft, keeper, and dynasty fantasy football teams with insights you can only get on the #1 fantasy football podcast -- Fantasy Football Podcast for November 29th, 2018. Week 13 and the fantasy football playoffs are coming! Find out which players Andy, Jason, and Mike are worried about during our “Pump the Brakes” segment. Get advice for Week 13 and the rest of the season as we answer a handful of listener questions! All this, and a fantasy preview of Thursday Night Football: Saints at Cowboys. Manage your redraft, keeper, and dynasty fantasy football teams with insights you can only get on the #1 fantasy football podcast -- Fantasy Football Podcast for November 28th, 2018. Waiver day! Stay on top of your fantasy football waiver wire, and look for these players to help your team in Week 13 and the fantasy playoffs. First, we recap the surprising Monday Night game between the Titans and Texans. Get caught up on the latest injury news, and don’t miss our Week 13 QB Streamer picks. Manage your redraft, keeper, and dynasty fantasy football teams with insights you can only get on the #1 fantasy football podcast -- Fantasy Football Podcast for November 27th, 2018. THE MEGALODON IS HERE! Andy, Mike, and Jason are back with a fantasy football Thanksgiving feast of a show as we enter Week 12. We preview ALL Week 12 matchups, reveal our Starts of the Week, Pump the Brakes, discuss the latest news, and lots more! Manage your redraft, keeper, and dynasty fantasy football teams with insights you can only get on the #1 fantasy football podcast -- Fantasy Football Podcast for November 21st, 2018. Waiver Wire day! With the fantasy playoffs approaching, it’s an important time to stay on top of your fantasy football waiver wire and look for these players to help your team in Week 12 and beyond. First, we recap the wild Monday Night game between the Chiefs and Rams, and don’t miss our Week 12 QB Streamer picks! Manage your redraft, keeper, and dynasty fantasy football teams with insights you can only get on the #1 fantasy football podcast -- Fantasy Football Podcast for November 20th, 2018. Week 11 is upon us! Get the fantasy football preview for a handful of Week 11 Matchups. We’ll cover the latest injury updates for Week 11 during In-or-Out, and don’t miss our LIVE Draft during the Daily Dose. Manage your redraft, keeper, and dynasty fantasy football teams with insights you can only get on the #1 fantasy football podcast -- Fantasy Football Podcast for November 16th, 2018. Week 11 is here! Get a fantasy football preview for a handful of Week 11 matchups before Andy, Jason, and Mike reveal their Starts of the Week! All this, plus the latest news and a great quick question about players that will be on championship teams! Manage your redraft, keeper, and dynasty fantasy football teams with insights you can only get on the #1 fantasy football podcast -- Fantasy Football Podcast for November 15th, 2018. Week 11 and the fantasy football playoffs are coming! Find out which players Andy, Jason, and Mike are worried about during our “Pump the Brakes” segment. Did Le’Veon Bell ever show up? Get advice for Week 11 and the rest of the season as we answer a handful of listener questions! All this, and a fantasy preview of Thursday Night Football: Packers at Seahawks. Manage your redraft, keeper, and dynasty fantasy football teams with insights you can only get on the #1 fantasy football podcast -- Fantasy Football Podcast for October 14th, 2018. Waiver Wire day! With the fantasy playoffs approaching, it’s an important time to stay on top of your fantasy football waiver wire and look for these players to help your team in Week 11 and beyond. If you’re looking for a QB replacement, don’t miss our Week 11 QB Streamer picks. Manage your redraft, keeper, and dynasty fantasy football teams with insights you can only get on the #1 fantasy football podcast -- Fantasy Football Podcast for November 13th, 2018. Hear all about the fantasy football Studs & Duds of Week 10 and what to expect going forward! Get caught up on the important injury news from Week 10 during the Weekly Rewind. All this, plus some fun fantasy football puns sent in from listeners and our Rising Stars of the Week! Manage your redraft, keeper, and dynasty fantasy football teams with insights you can only get on the #1 fantasy football podcast -- Fantasy Football Podcast for November 12th, 2018. Week 10 is here! Get the fantasy football preview for a handful of Week 10 Matchups. We’ll recap the Panthers/Steelers game and discuss the Le’Veon Bell & James Conner situation. Get caught up on the latest injury updates for Week 10 during In-or-Out, and don’t miss our LIVE Draft during the Daily Dose. Manage your redraft, keeper, and dynasty fantasy football teams with insights you can only get on the #1 fantasy football podcast -- Fantasy Football Podcast for November 9th, 2018. Week 10 is here! Get a fantasy football preview for a handful of Week 10 matchups before Andy, Jason, and Mike reveal their Starts of the Week! All this, plus the latest news including Dez Bryant signing with the Saints! Manage your redraft, keeper, and dynasty fantasy football teams with insights you can only get on the #1 fantasy football podcast -- Fantasy Football Podcast for November 8th, 2018. Get ready for Week 10 with a special Playoff Primer episode of The Fantasy Footballers Podcast! Find out which players have juicy or intimidating fantasy playoff schedules, and if you should do anything about it! All this, plus a fantasy football preview of Thursday Night Football: Panthers at Steelers. Manage your redraft, keeper, and dynasty fantasy football teams with insights you can only get on the #1 fantasy football podcast -- Fantasy Football Podcast for November 7th, 2018. Waiver Wire time! With the fantasy playoffs approaching, it’s an important time to stay on top of your fantasy football waiver wire and look for these players to help your team in Week 10 and beyond. If you’re looking for a QB replacement, don’t miss our Week 10 QB Streamer picks. Manage your redraft, keeper, and dynasty fantasy football teams with insights you can only get on the #1 fantasy football podcast -- Fantasy Football Podcast for November 6th, 2018. Hear all about the fantasy football Studs & Duds of Week 9 and what to expect going forward! What’s the big news about A.J. Green? Get caught up on the important injury news from Week 9 during the Weekly Rewind. All this, plus some fun fantasy football puns sent in from listeners and our Rising Stars of the Week! Manage your redraft, keeper, and dynasty fantasy football teams with insights you can only get on the #1 fantasy football podcast -- Fantasy Football Podcast for November 5th, 2018. Week 9 is here! Let’s set those fantasy football lineups to dominate this weekend! Get the fantasy football preview for a handful of Week 9 Matchups. We’ll catch you up on the latest injury updates for Week 9 during In-or-Out, and don’t miss our LIVE Draft during the Daily Dose. Manage your redraft, keeper, and dynasty fantasy football teams with insights you can only get on the #1 fantasy football podcast -- Fantasy Football Podcast for November 2nd, 2018. Week 9 and the Bye-pocalypse is upon us! Get a preview for a handful of Week 9 matchups before Andy, Jason, and Mike reveal their Starts of the Week! All this, plus Lev Bell Watch, and of course, Jason’s Boom Boom Kicker! Manage your redraft, keeper, and dynasty fantasy football teams with insights you can only get on the #1 fantasy football podcast -- Fantasy Football Podcast for November 1st, 2018. Get ready for Week 9 with a special Halloween edition of The Fantasy Footballers Podcast! Get the lowdown on the big NFL Trades including Demaryius Thomas to the Texans & Golden Tate to the Eagles. Find out who Andy, Jason, and Mike are worried about for Week 9, and which players will haunt you the rest of the season. All this, plus a fantasy football preview of Thursday Night Football: Raiders at 49ers. Manage your redraft, keeper, and dynasty fantasy football teams with insights you can only get on the #1 fantasy football podcast -- Fantasy Football Podcast for October 31st, 2018. Waiver Wire time! Stay on top of your fantasy football waiver wire and look for these players to help your team in Week 9 and beyond. If you’re looking for a QB replacement, don’t miss our Week 9 QB Streamer picks. Manage your redraft, keeper, and dynasty fantasy football teams with insights you can only get on the #1 fantasy football podcast -- Fantasy Football Podcast for October 30th, 2018. Find out who made the fantasy football Studs & Duds lists for Week 8 and what to expect going forward! Get caught up on the important injury news during the Weekly Rewind. Breaking News about Hue Jackson! All this, plus some fun fantasy football puns sent in from listeners and our Rising Stars of the Week! Manage your redraft, keeper, and dynasty fantasy football teams with insights you can only get on the #1 fantasy football podcast -- Fantasy Football Podcast for October 29th, 2018. Week 8 is upon us! Let’s set those fantasy football lineups to dominate this weekend! Get the fantasy football preview for a handful of Week 8 Matchups. With Will Fuller out for the season, what does that mean for the Texans offense? We’ll catch you up on the latest injury updates for Week 8 during In-or-Out, and don’t miss our LIVE Draft during the Daily Dose. Manage your redraft, keeper, and dynasty fantasy football teams with insights you can only get on the #1 fantasy football podcast -- Fantasy Football Podcast for October 26th, 2018. Week 8 is here! Get a preview for a handful of Week 8 matchups before Andy, Jason, and Mike reveal their Starts of the Week! All this, plus a discussion about “Renting Players” through fantasy trades, and of course, Jason’s Boom Boom Kicker! Manage your redraft, keeper, and dynasty fantasy football teams with insights you can only get on the #1 fantasy football podcast -- Fantasy Football Podcast for October 25th, 2018. Get ready for Week 8! With fantasy football trade deadlines approaching, Andy, Mike, and Jason review a handful of trades sent in from listeners! Don’t miss our weekly Pump the Brakes segment for Week 8. All this, plus the latest NFL News, and a fantasy preview of Thursday Night Football: Dolphins at Texans. Manage your redraft, keeper, and dynasty fantasy football teams with insights you can only get on the #1 fantasy football podcast -- Fantasy Football Podcast for October 24th, 2018. Waiver Wire time! Stay on top of your fantasy football waiver wire and look for these players to help your team in Week 8 and beyond. Amari Cooper traded to the Cowboys! What’s are the fantasy football implications? If you’re looking for a QB replacement, don’t miss our Week 8 QB Streamer picks. Manage your redraft, keeper, and dynasty fantasy football teams with insights you can only get on the #1 fantasy football podcast -- Fantasy Football Podcast for October 23rd, 2018. With Week 7 mostly in the books, it’s time to break down the Studs & Duds performances and look forward to Week 8 and beyond! What’s the fantasy football outlook for Nick Chubb after Carlos Hyde was traded to the Jaguars? Get caught up on the important injury news during the Weekly Rewind. Manage your redraft, keeper, and dynasty fantasy football teams with insights you can only get on the #1 fantasy football podcast -- Fantasy Football Podcast for October 22nd, 2018. Week 7 is here! Let’s set those fantasy football lineups to dominate this weekend! Get the fantasy football preview for a handful of Week 7 Matchups. We’ll catch you up on the latest injury updates for Week 7 during In-or-Out. Hear all about last night’s Broncos vs Cardinals game, and don’t miss our LIVE Draft during the Daily Dose. Manage your redraft, keeper, and dynasty fantasy football teams with insights you can only get on the #1 fantasy football podcast -- Fantasy Football Podcast for October 19th, 2018. Gladiator: Aaron Hernandez & Football Inc.
Week 7 is here! Get a preview for a handful of Week 7 matchups before Andy, Jason, and Mike reveal their Starts of the Week! All this, plus a fun game of “Who Am I?” and Jason’s Boom Boom Kicker! Manage your redraft, keeper, and dynasty fantasy football teams with insights you can only get on the #1 fantasy football podcast -- Fantasy Football Podcast for October 18th, 2018. Week 7 is coming! What are you to do with the perceived “studs” drafted in the early rounds of fantasy football drafts? Who are Andy, Mike, and Jason concerned about for Week 7? All this, plus the latest NFL News, and a fantasy preview of Thursday Night Football: Broncos at Cardinals. Manage your redraft, keeper, and dynasty fantasy football teams with insights you can only get on the #1 fantasy football podcast -- Fantasy Football Podcast for October 17th, 2018. It’s Waiver Day! Take a look at your fantasy football waiver wire for these players to help your team in Week 7 and beyond. If you’re looking for a QB replacement, don’t miss our Week 7 QB Streamer picks. All this, plus a Monday Night Football recap and the latest NFL News. Manage your redraft, keeper, and dynasty fantasy football teams with insights you can only get on the #1 fantasy football podcast -- Fantasy Football Podcast for October 16th, 2018. Find out who made the fantasy football Studs & Duds lists for Week 6 and what to expect going forward! Get caught up on the important injury news during the Weekly Rewind. All this, plus some fun fantasy football puns sent in from listeners and our Rising Stars of the Week! Manage your redraft, keeper, and dynasty fantasy football teams with insights you can only get on the #1 fantasy football podcast -- Fantasy Football Podcast for October 15th, 2018. Week 6 is here! Set your fantasy football lineups to dominate this weekend! Get the fantasy football preview for a handful of Week 6 Matchups. We’ll catch you up on the latest injury updates for Week 6 and don’t miss our LIVE Draft during the Daily Dose. Manage your redraft, keeper, and dynasty fantasy football teams with insights you can only get on the #1 fantasy football podcast -- Fantasy Football Podcast for October 12th, 2018. Week 6 is always an important one for fantasy football. Get a preview for a handful of Week 6 matchups before Andy, Jason, and Mike reveal their Starts of the Week! All this, plus the latest NFL News including Thursday Night Football injury updates and Jason’s Boom Boom Kicker. Manage your redraft, keeper, and dynasty fantasy football teams with insights you can only get on the #1 fantasy football podcast -- Fantasy Football Podcast for October 11th, 2018. Week 6 is coming! We’ll help you decide if you should Keep, Trade, or Cut a handful of disappointing players. Find out which players you may want to “Pump the Brakes” on in Week 6. All this, plus the latest NFL News, and a fantasy preview of Thursday Night Football: Eagles at Giants. Manage your redraft, keeper, and dynasty fantasy football teams with insights you can only get on the #1 fantasy football podcast -- Fantasy Football Podcast for October 10th, 2018. Waiver Wire time! Take a look at your fantasy football waivers for these players to help your team in Week 6 and beyond. If you’re looking for a QB replacement, don’t miss our Week 6 QB Streamer picks. All this, plus a Monday Night Football recap including Drew Brees making history, while making Jason’s fantasy football team 0-5. Manage your redraft, keeper, and dynasty fantasy football teams with insights you can only get on the #1 fantasy football podcast -- Fantasy Football Podcast for October 9th, 2018. Find out who made the fantasy football Studs & Duds lists for Week 5 and what to expect going forward! Plenty of injury news from this weekend, get caught up during the Weekly Rewind. All this, plus big Week 5 surprises and fantasy football rising stars! Manage your redraft, keeper, and dynasty fantasy football teams with insights you can only get on the #1 fantasy football podcast -- Fantasy Football Podcast for October 8th, 2018. Set your fantasy football lineups to dominate this weekend! Get the fantasy football preview for a handful of Week 5 Matchups. We’ll catch you up on the latest injury updates for Week 5 and don’t miss our LIVE Draft during the Daily Dose. Manage your redraft, keeper, and dynasty fantasy football teams with insights you can only get on the #1 fantasy football podcast -- Fantasy Football Podcast for October 5th, 2018. Week 5 is here! Get a fantasy football preview for a handful of Week 5 matchups before Andy, Jason, and Mike reveal their Starts of the Week! All this, plus the latest NFL News including Thursday Night Football injury updates and Jason’s Boom Boom Kicker. Manage your redraft, keeper, and dynasty fantasy football teams with insights you can only get on the #1 fantasy football podcast -- Fantasy Football Podcast for October 4th, 2018. Week 5 is coming! Find out which players Andy, Jason, and Mike are worried about for Week 5 during our “Pump the Brakes” segment. Which players are on the chopping block if they bust again in Week 5? All this, plus the latest NFL News, and a fantasy preview of Thursday Night Football: Colts at Patriots. Manage your redraft, keeper, and dynasty fantasy football teams with insights you can only get on the #1 fantasy football podcast -- Fantasy Football Podcast for October 3rd, 2018. Waiver Wire Day! Take a look at your fantasy football waivers for these players to help your team in Week 5 and beyond. Is Le’Veon Bell coming back?! What to do with James Conner? Plus, if you’re looking for a QB replacement, don’t miss our Week 5 QB Streamer picks. Manage your redraft, keeper, and dynasty fantasy football teams with insights you can only get on the #1 fantasy football podcast -- Fantasy Football Podcast for October 2nd, 2018. Find out who made the fantasy football Studs & Duds lists for Week 4 and what to expect going forward! Plenty of injury news from this weekend, get caught up during the Weekly Rewind. All this, plus big Week 4 surprises and fantasy football rising stars! Manage your redraft, keeper, and dynasty fantasy football teams with insights you can only get on the #1 fantasy football podcast -- Fantasy Football Podcast for October 1st, 2018. All Hail King Goffrey! We recap the Vikings/Rams scoring fest from Thursday Night Football. Set your fantasy football lineups to dominate this weekend! Get the fantasy football preview for a handful of Week 4 Matchups. We’ll catch you up on the latest injury updates for Week 4 and don’t miss our LIVE Draft during the Daily Dose. Manage your redraft, keeper, and dynasty fantasy football teams with insights you can only get on the #1 fantasy football podcast -- Fantasy Football Podcast for September 28th, 2018. Week 4 is here! Get a fantasy football preview for a handful of Week 4 matchups before Andy, Jason, and Mike reveal their Starts of the Week! Who is the most, under pressure, to perform in Week 4 for fantasy football owners? All this, plus the latest NFL News and Jason’s Boom Boom Kicker. Manage your redraft, keeper, and dynasty fantasy football teams with insights you can only get on the #1 fantasy football podcast -- Fantasy Football Podcast for September 27th, 2018. Week 4 is almost here! Find out which players Andy, Jason, and Mike are worried about for Week 4 during our “Pump the Brakes” segment. We’ll reveal our favorite trade targets before looking at some interesting snap count surprises. All this, plus the latest NFL News, and a fantasy preview of Thursday Night Football: Vikings at Rams. Manage your redraft, keeper, and dynasty fantasy football teams with insights you can only get on the #1 fantasy football podcast -- Fantasy Football Podcast for September 26th, 2018. Waiver Wire Day! Take a look at your fantasy football waivers for these players to help your team in Week 4 and beyond. It was a wild Monday night game; will the Fitzmagic continue when Jameis Winston comes back? Plus, if you’re looking for a QB replacement, don’t miss our Week 4 QB Streamer picks. Manage your redraft, keeper, and dynasty fantasy football teams with insights you can only get on the #1 fantasy football podcast -- Fantasy Football Podcast for September 25th, 2018. Find out who made the fantasy football Studs & Duds lists for Week 3! How serious is the Jimmy Garoppolo injury? Get caught up on all the Week 3 injuries during the Weekly Rewind. Plus, find out which players we consider rising stars in fantasy football. Manage your redraft, keeper, and dynasty fantasy football teams with insights you can only get on the #1 fantasy football podcast -- Fantasy Football Podcast for September 24th, 2018. Browns win! We’ll discuss the big night for the Cleveland Browns including Baker Mayfield and Tyrod Taylor. Set your fantasy football lineups to dominate this weekend! Get the lowdown on which players to start in a handful of matchups during the Fantasy Forecast. Get the latest injury updates for Week 3 and don’t miss our LIVE Draft during the Daily Dose. Manage your redraft, keeper, and dynasty fantasy football teams with insights you can only get on the #1 fantasy football podcast -- Fantasy Football Podcast for September 21st, 2018. Week 3 is here! Get a fantasy football preview for a handful of Week 3 matchups before Andy, Jason, and Mike reveal their Starts of the Week! We’ll catch you up on the latest NFL News. And finally, everyone’s favorite segment, Jason’s Boom Boom Kicker. Manage your redraft, keeper, and dynasty fantasy football teams with insights you can only get on the #1 fantasy football podcast -- Fantasy Football Podcast for September 20th, 2018.